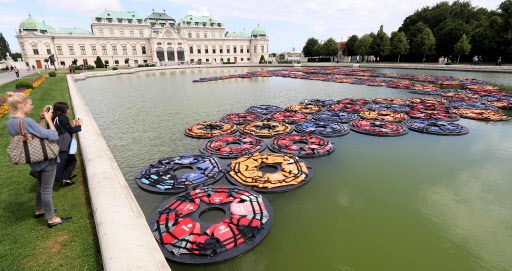 VIENNA (AFP) - Visitors to Vienna’s Belvedere Palace were confronted Wednesday with 1,005 refugees’ life jackets drifting in the baroque pond -- courtesy of Chinese dissident artist Ai Weiwei. The installation, entitled “F. Lotus,” consists of 201 rings each holding five life jackets -- retrieved from the Greek island of Lesbos -- arranged in the letter “F” and floating like lotus flowers. Ai, who in February this year attached 14,000 life jackets to the columns of a Berlin concert house, said that the work was his way of addressing the tragedy of Europe’s migrant crisis. The artist went too far for some earlier this year when he recreated the death pose of Aylan Kurdi, the Syrian toddler found dead on a Turkish beach in 2015, in a photo shoot for an Indian magazine. China’s most prominent contemporary artist helped design the Bird’s Nest stadium for the Beijing Olympics, but his works have often fallen foul of China’s authorities. In 2011, he was detained for 81 days.